"Very entertaining and well written! Be prepared to laugh out loud as you follow Jeremy and Dorothy from one crazy adventure to the next." Sick of your friends telling you what a great time they had on vacation while you were stuck at home? Wouldn’t you prefer to hear about their pain and suffering caused by sunburns, travelers’ diarrhea, and mosquito bites? I am a newlywed in my late twenties who longed to see the world with my wife before we settled down. We halted our careers and exhausted our savings to embark on an eight-month around-the-world adventure. Our journey took us to Central and South America, New Zealand, Australia, Asia, and Europe. 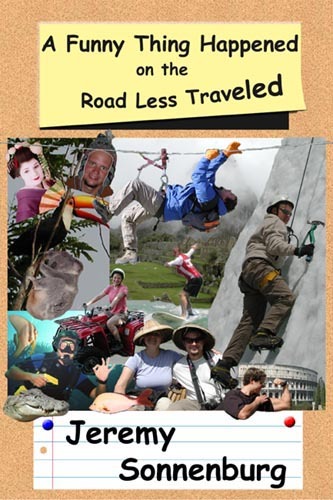 As we traveled, I wrote A Funny Thing Happened on the Road Less Traveled, a light, entertaining collection of travel comedies that will have you laughing out loud as you join us on our trail of misadventures. I invite you to read the sample chapters, glance at the book reviews and check out our online photo album. If you like what you see, you can buy the book online. Also, please email your friends and link them to the site. I am depending on a grassroots, word-of-mouth promotion campaign and every new link helps. Thanks for your support.